Nearly three decades after the great Civil War firmly established the ideals of freedom for all men within our shores, this great American dream was finding its way into the hearts of a distinct group of oppressed peoples. These were pious and simple souls who, in their sincere humility and strong faith in God, emanated an unsurpassed greatness. Our Slavic forefathers were already established as a distinct group within the Great Moravian Empire as early as the seventh century. This region of Moravia bounded the Moravian River in Czechoslovakia. The Slavs were an agricultural, not a conquering people, accustomed to living in a place of "plenty. " They had migrated to the region of the Carpathian Mountains, where the land was beautiful and fertile, only when conditions became crowded. The word "Slav" comes from the Old Slavonic word "Slovo" meaning word or speech. Thus, the "Slovani" were those who knew words in contrast to the neighboring Germans whose sounds (words) were unfamiliar. Our present English word comes from the Greek, "Sklavenas," Slavic; Germans were called Nemec, meaning difficult to understand. The first ones to foster aggression against the Slavs were the Franks (from present-day Germany) in the year 846. After various conflicts, freedom was finally established through the efforts of the Slav leader, Ratislav. With their boundaries secure, the Slavs became interested in Christianity. The Franks tried to promulgate the Latin Rite, but the Slavs, fearing their neighbors' cross as much as their sword, turned to Constantinople for missionaries. In so doing, the Slavs secured as well a powerful ally and protector against any future Frankish moves. The Emperor of Constantinople sent the brothers, Cyril and Methodius, to the Slavs. Cyril gave the Slavs an alphabet to express Slavonic sounds and translated all the ecclesiastical books from Greek into Slavonic. In the year 863, the Slavic people embraced the Byzantine Rite (the term "Byzantine" is derived from the original name of the city of Constantinople which was "Byzantium" prior to its Christianization in 330 AD.) along with the Cyrillic alphabet, which today is known as Church Slavonic-the liturgical language of our people. It was through the efforts of Saints Cyril and Methodius, then, that the faith and Rite of the Byzantine Church of Constantinople were planted among the Slavs. It was a Rite of profound mystical expression, which the Slavs embraced wholeheartedly because it was so closely geared to their own mentality. The awe and mystery of the Greek culture captured their hearts. In the year 1054 the entire Church was rent by an event so gigantic that ramifications continue to the present day. The Eastern Schism separated Rome and Constantinople. Accordingly, our people too, under the canonical jurisdiction of Constantinople, followed the Church leadership into schism. It wasn't until 1646 that a small group of priests ratified a reunion with Rome at the Union of Uzhorod. From this Union our people trace their Catholicity, often severely tried and scrutinized both in Europe and, in a most devastating way, here in this country with the turmoil of the celibacy issue in the 1930's. Following their Christianization, our forefathers continued their simple life of farming in the area of the Carpathian Mountains (Podkarpatska Rus; i.e., Sub-Carpathian Ruthenia). This area was a part of the Kingdom of Hungary, which was, in the nineteenth century, part of the dual monarchy of Austria-Hungary ruled by Emperor Franz Joseph for 68 years. During the reign of Franz Joseph the Empire was riddled with unrest and famine. The dual monarchy endured for 51 years, but it contained a fatal defect; it did not recognize the national aspirations of the Slavic peoples. Our forefathers were constantly under subjugation and considered as serfs by the feudalistic lords of Hungary at that time. In addition, the Austrian and Hungarian barons constantly oppressed our people. Because of this ill treatment and the many indignities they suffered, the Slavs were most anxious to seek freedom. Today, the area of Sub-Carpathian Ruthenia is non-existent because on June 29, 1945, Czechoslovakia and the Soviet Union signed an agreement, which acknowledged the incorporation of Sub-Carpathian Ruthenia into the U.S.S.R. The demise of the U.S.S.R. brought freedom to the Countries of the Soviet Bloc. The people of Czechoslovakia determined that they would become autonomous, thus creating the Czech Republic and the Republic of Slovakia. Sub-Carpathia is presently in the Republic of Slovakia. The word "Ruthenian" is used to distinguish our people from the Russians on their eastern border. The root of the word comes from the word "Rusin" meaning "Son of Rus" or "Little Russian." Since the area geographically was nestled within the Carpathian Mountains, they qualified the term and referred to themselves as Carpatho-Rusins. In summary, then, our forefathers are of the Slav or Slavonic heritage, are Rusin or Ruthenian by nationality, and religiously are Catholics of the Byzantine Rite. Their love of God, as expressed in this beautiful Eastern Rite of the Church, was to become their lasting contribution to us and to our American culture. Through God's providence, the credentials of goodness and honesty were to become our forefathers' lasting contribution to America's greatness. For the members of Holy Spirit Parish in Mahwah, New Jersey, this inspiring story unfolds in the metropolitan areas of the northeastern United States. 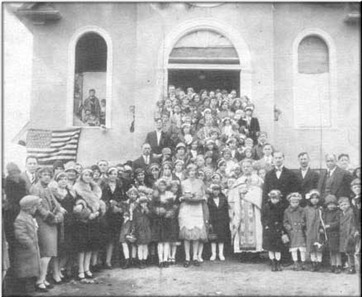 Several years before the actual founding of our parish in 1926 immigrants from Eastern Europe had arrived in America and settled in Mahwah, Ramapo, Suffern, Tuxedo and other surrounding towns. These industrious people, for the most part, were lured by prospects of employment in the American Brake Shoe Company (presently Abex Research) located along Route 202 and the Franklin Turnpike. Besides the Rusin were many Slovak, Ukrainian, Polish, Hungarian and Russian faithful. Despite their diverse nationalities, these people by and large found a common bond in their languages since they shared the same linguistic roots. The founders-to-be of our parish, in spite of the hard work and long hours, enjoyed a measure of relative financial independence. But even though earning a good livelihood, they felt the need of something more vital, for they were deprived of the full benefits of their religion. There was no nearby church where they could confess and hear the Gospel in their own tongue. Being devout Catholics, many of our faithful made the long trip by train to St. Michael's Greek Catholic Church in Passaic or attended services at the Sacred Heart Roman Catholic Church in Suffern, N.Y. or at the old St. Paul's Roman Catholic Church in Ramsey, N.J. In 1915 the Polish Parish of Immaculate Heart of Mary was established on Island Road. It was to this new parish that the majority of our faithful went for approximately ten years until steps were taken to establish a parochial community where they could worship God in their own Eastern Rite. In the interim, Father Michael Jackovich, Pastor at St. Michael's, periodically visited the small community of Greek Catholics on Island Road, utilizing the facilities of Immaculate Heart of Mary Church. On September 12, 1925 the first meeting was held to organize Holy Spirit Parish. A letter from Bishop Takach instructed the fledgling congregation to enlist the help of Father Jackovich in the campaign. By a unanimous vote, John Lucas and Michael Micik were elected President and Secretary respectively; John Sima became Treasurer. The following roll is found in the minutes of that meeting; John Lucas, Stefan Tymcyzyn, Michael Micik, John Belovics, Daniel Tymoch, Zachary Hruscik, Hnat (Ignatius) Petrick, Stefan Gazda, George Parnahay, Michael Belovics, John Sima, Basil Melnik, Michael Megles, Andrew Fedor, Andrew Sima, George Homa, Anthony Karpovich, John S. Sima, Michael Yuhas and John H. Balog. A little more than a year later on November 12, 1926 Holy Spirit Church was incorporated according to the laws of the State of New Jersey under the canonical jurisdiction of the then Diocese of Pittsburgh under our beloved Bishop of happy memory, the Most Reverend Basil Takach, D.O. The congregation assumed the legal title "Holy Ghost Catholic Church of the United Greek Catholic Rite." Shortly after the organizational work was completed, Father John J. Dorohovich was appointed Pastor and lived for a while in a small apartment in Mahwah. For a brief period, liturgical services were conducted in a community hall (now a private home) located on Wilmuth Street not far from the present church site. Later the Belovics family, living at 105 Church Street, graciously opened its home to the congregation, and there services were conducted for about a year. At this point, the parishioners of Holy Spirit Church were faced with a problem that was to remain with them for many years- the lack of a resident pastor. The reason for this was twofold: the general need for priests of the Byzantine Rite throughout the United States and the small size of the parish. From 1926 until 1963, the Pastors and Assistants who had their residence at St. Michael’s Church in Passaic served Holy Spirit Church. On June 3, 1927 the present site of the parish was purchased. At a meeting on August 19, 1928 (the Feast of the Transfiguration according to the Julian Calendar), Korcinsky Contractors from Rutherford, N.J. and Campbell Architects from Clifton, N.J. were awarded the building bid at $13,808.74 to be paid out in four installments, with construction to be completed within four months. On August 28, 1928 (Feast of the Dormition) the foundation was laid for our frame and stucco church. By late September, services were already being conducted in the basement of the unfinished building. On October 14, 1928 (Feast of the Patronage of the Mother of God) the cross, blessed by Fathers Michael Jackovics and John Dorohovich, was placed in the church tower. 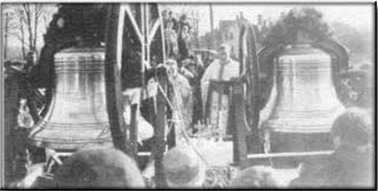 On Sunday, November 11,1928 the same two priests blessed our two bells, cast at the Meneely Bell Company Foundry in Troy, New York. The larger bell was christened Nicholas and the smaller, Michael. On a beautiful Thanksgiving Day (November 29, 1928), the cornerstone was blessed by Fathers Jackovich and Dorohovich, followed by a jubilant reception hosted by the women of the parish. On January 23, 1929, construction was completed. Incredibly, the original mortgage incurred on January 29, 1929 was discharged in the short span of only seven years (April 20, 1936) due to the diligent labors of the first trustees, Michael Micik and Wasil Melnik, coupled with the generosity and self-sacrifices of the parishioners, dedicated and loyal, though few in number. In the late spring of 1929, on the Sunday after Pentecost, Bishop Takach, together with local clergy, solemnly blessed and dedicated the new house of worship. The painting of the church interior with religious murals at a cost of $1,150.00 was awarded to Demetrius Zacharchuk under Father Dorohovich's authorization. In the course of the years to follow continuous improvements have been made. 1953 marked the Silver Anniversary of the parish, which was commemorated on November 7th of that year with appropriate liturgical and social ceremonies. Chairman of the Jubilee Committee was Father Stephen P. Luzetsky, assisted by Peter Kuncik and Paul Gazda. Sophie and Stella Patrick managed ticket sales, while Mr. and Mrs. Paul Gazda, Mrs. Daniel Padluck, Mrs. Margaret Milhalko and Mrs. John Mikulaninec, Sr. were on the Banquet Committee. Chairman of the Jubilee Booklet Committee was Anthony Timothy, aided by Nancy Micik, Rosemary Kurucz, Johanna Padluck, Sophie and Stella Patrick, John Micik, Betty Collins, Raymond Fedors, Margaret Dvorak and Yolanda Megles. Michael Tymoch, Nancy Micik, Mary Begala and Stella Patrick handled the dance and decorations, while Paul Gazda, Andrew Megles and Daniel Padluck managed refreshments. Benediction of the Blessed Sacrament took place at 5:00 p.m., followed by a banquet at 5:30 p.m. Father Joseph Haluch, S.D.B.., opened the program with an invocation. Father Luzetsky welcomed the assembly, after which addresses and remarks were made by the following: Rev. Joseph Haluch, S.D.B., Pastor of Immaculate Heart of Mary R.C. Church, Mahwah; Rev. Sergius Bachkovsky, O.S.B., Pastor of St. Mary's Greek Catholic Church, New York City; Mayor Charles N. Feldman, Mahwah; John Sima, First Parish Treasurer; Peter Kuncik and Paul Gazda, Trustees and John Mikulaninec, Cantor. Father Bachkovsky introduced the guests of honor and concluded the program with a benediction. Four years later, on June 23, 1957, Most Rev. Nicholas T. Elko blessed the extensively redecorated church; Chairman of the General Committee was Rev. William Kozar, assisted by George Begala and Daniel Padluck. The Program Book and Banquet Committee included Nancy Micik, Rosemary Kurucz, Yolanda Megles, Sophie and Stella Patrick, George Begala, Michael Tymoch and Daniel Padluck. Nancy Micik, Sophie and Stella Patrick, Rosemary Kurucz and Yolanda Megles arranged the Dance and Decorations, while Michael Seman, Andrew Megles, Daniel Padluck, Michael Tymoch, George Gera and George Begala managed refreshments. The liturgical program began with the Pontifical Liturgy at 10:00 a.m. followed by dinner at 12:30 p.m. Among the speakers on the banquet program were His Excellency, Bishop Elko; Father Joseph Haluch, S.D.B. ; Mayor Charles N. Feldman; John Sima; Daniel Padluck and Msgr. John Stim, the Pastor. 1963 marked an important milestone in the history of Holy Spirit Parish. In that year the first permanent resident pastor was appointed in the person of Father John S. Danilak, who found a temporary home with the late Mrs. Barbara Megles, an elderly widow. Prior to 1963 the administrating pastors had been commuting from St. Michael's in Passaic. Father Danilak lost no time in organizing fund-raising projects and committees to support the building of a rectory. On June 20, 1965 Bishop Stephen J. Kocisko, First Eparch of the newly formed Eparchy of Passaic, solemnly blessed the newly constructed parish home and redecorated church. Father Danilak was General Chairman of the Dedication Committee, assisted by George Fencik and Ernest D. Yackanich. Edward Zotyak, George Gera, Richard Gazda, Margaret Gera and Frank Bick were responsible for the program book. Louis and Nelly Karpowich, Betty Kostecky and Irene Padluck solicited advertisements. George Kostecky, Florence Zotyak and George Lencsak handled the reception. Paul and Veronica Gazda took charge of the Banquet and Dance, while Helen Gazda and the Ladies' Guild managed the invitations and tickets. Richard and Nancy Antonick and Margaret Milhalko arranged publicity. George and Michael Begala directed traffic. Walter Karpowich provided the sound system. Father Danilak's stay was to be short but intensely productive. In August 1965, a new pastor, Father John Drozda, came to the parish, remaining at Holy Spirit for five years. Recognizing the growth potential of the parish and the need for a future parish center, Father Drozda negotiated the purchase of 14 acres of prime real estate in February 1969 from Percy and Ruby Umscheid at 247 Airmont Avenue, Mahwah. A weekly Bingo was inaugurated to assist in defraying the mortgage of $140,000.00. In the beginning of May, 1970 Father Nicholas Alishofski arrived to replace Father Drozda. During his short three-year but very active stay Father was able to complete numerous improvements on the new land as well as to arrange for needed repairs and further redecorations of the church proper. The entire church exterior was brick faced. New stone steps, exterior lighting, landscaping, and a beautiful entrance mosaic of Christ were all installed. The church interior was completely repainted, new crystal chandeliers hung, carpeting installed and various new liturgical appointments were purchased, in addition to the installation of a new natural-gas heating system in the church An on-going Religious Education Program was enlarged to include all grade levels, and the youth were organized into the Parish B.C.Y. In August 1973, Rev. John T. Sekellick, S.T.B., was appointed the Pastor of Holy Spirit Church. To complete the refurbishing of the church, a new roof and lightning rods were installed in September 1973, and the Icon of Christ commissioned by Father Alishofski and executed by Baransky Studios in Yonkers, N.Y. was mounted on the wall behind the main altar. During the summer of 1974 several improvements were made on the Airmont Property, among them being the extensive clearing of several more acres of land with the newly purchased Leyland Tractor and the installation of rest-room facilities in the smaller home in the picnic Ground area. A secondary telephone line was added to the parish service to facilitate communication between our two properties. Propane-gas service was made available to provide hot running water, and a porch was added to the basement of our smaller home at the same time plastering of the basement interior and exterior was being done. A small chapel was furnished and opened in the home to provide shelter in the event of inclement weather during services in the open sanctuary grove. Holy Spirit honored its cantor, Mr. Richard Pelar, in February 1974 with a testimonial dinner on the anniversary of his ten years' service to the parish. Regrettably in December of 1974, due to declining revenue and mounting overhead, we were forced to terminate our Monday night Bingo games at the Elks Lodge in Mahwah. In March, 1975 Hiemer and Company of Clifton, N.J. installed much needed protective glass over all our stained-glass windows. During the summer of 1975 a large stone-faced barbecue pit was added to the kitchen facilities on the Airmont Picnic Grove, and an extension was added to the wooden garage to accommodate the refreshment concession for picnics and social gatherings. The details of Mahwah's early history are difficult to trace. Dutch and Polish settlers did not record facts with the same zeal and minute correctness as their New England contemporaries. However, it has been established that Mahwah derived its name from the Indian phrase "Maa Eway," which means "field or meeting place." The earliest known inhabitants were the Lenni Lenape Indians. They were a peaceful tribe, embers of the Delaware Nation, and occupied all of Bergen County. Throughout the entire area they built hoguns, farmed, hunted and fished. It was good land and they prospered. It was here in "Maa Eway" that the chiefs and elders met to celebrate tribal rites and administer their primitive laws. This meeting place occupied the flatland south of the present bus terminal. Many arrowheads and other relics have been recovered which have aided in depicting the character of Mahwah's first settlers. While the section is now referred to as Mahwah, it also was known as Ramapaugh, and in 1740 the Indians deeded the area comprising 42,000 acres, known as the Ramapo Tract, to twenty-four proprietors. Albert Saboriski (Zabriski), a Polish nobleman, was one of the proprietors. He acquired most of the land where Mahwah now is located, and his descendants, the Winter family, have inherited the land through successive generations. The Holland Society in New York City preserves the original deed transferring the property from the Indians to Count Saboriski.